Presiding over the beginning of the end of the muscle-car era was the 1970 chevy chevelle ss454. Federal emissions standards and the trend toward smaller, more efficient engines were starting to conspire to relegate the big-engined, gas-guzzling intermediate-size performance cars of the 1960!s to collectors showrooms. Serious looks the bulky, muscular body and the thick racing stripe of the ss (super sport) 454 make no attempt to hide the cars power. Though of dubious functionality, the cowl induction, a small louver on the hood that swivels open to feed cold air into the engine, also helps to give the 454 the look of a performance demon. and serious performance but the ss454s powerful looks only hint at the potency under the hood. The chevelles 454-cu.-in. Big block engine pumps out a formidable 450 hp for the ls6 edition, the highest of any american production car in 1970. It could race from zero to sixty mph in a mere 5.4 seconds and reach 104 mph in 13.81 seconds in the standing 14 mile. But in the next production year, as a sign of the times, the ls6 was dropped, leaving the 390hp ls5 model as the only available chevelle ss454. 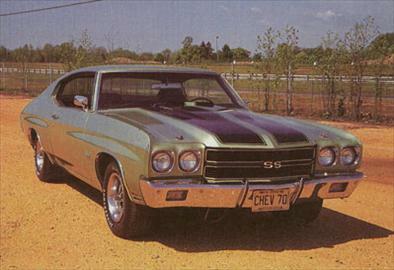 The ss454 was the pinnacle of muscle car strength, as chevrolet steadily decreased the horsepower for subsequent models.